MyEclipse IDE vendor Genuitec is stepping up the general developer downloads plate to take a swing at the task of automated and managed updates, plug-ins and patches to such widespread tools as Eclipse, Android, ColdFusion. The free Pulse service helps bring a "single throat to choke" benefit to downloads but without the need to remain dependent on a single commercial vendor (or track all the bits yourself) amid diverse open source or ecology offerings. Fellow independent IT analyst Tony Baer has a piece on Pulse. The service is in beta, with version 1.0 due in early 2008. Google's Android SDK -- a software stack focused on mobile devices -- and Android Development Tools (ADT) will come preconfigured to run with one click in Pulse's “Popular” profile area, Genuitec announced in December. That shows how quickly new offerings can be added to a Pulse software catalog service. Pulse refresh includes support for developers using Mac, Linux and Windows. Pulse requires an agent be downloaded to an Eclipse Rich Client Platform (RCP). The services put Genuitec squarely in the "value as a service" provider role to many types of developers. As we know, developers rely on communities as focal points for knowledge, news, updates, shared experience, code, and other online services. As we've seen in many cases, a strong community following and sense of shared value among developers often bodes well for related commercial and FOSS products alike. Genuitec is obviously interested in wider use of MyElipse, and is therefore providing community innovation as a channel. I also expect that Genuitec will move aggressively into "development and deployment as a service" offerings in 2008. There's no reason why a Pulse set of services could not evolve into a general platform for myriad developer resources and increasingly tools/IDEs as a service. Indeed, Genuitec is finding wider acceptance by developers of developing and deploying in the cloud concepts and benefits. 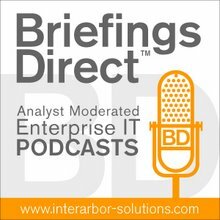 Disclosure: Genuitec is a sponsor of BriefingsDirect podcasts. So while Amazon offers to developers runtime, storage, and databases as services -- based on a pay as use and demand increases basis -- the whole question of tools is very interesting. The whole notion of free of very inexpensive means to development and deployment will prove a major trend in 2008, I predict. Now there is virtually no barriers for developer innovation and entrepreneurial zeal to move from the white board to global exposure and potential use. And that can only be good for users, enterprises, ISVs, and the creativity that unfettered competition often unleashes.